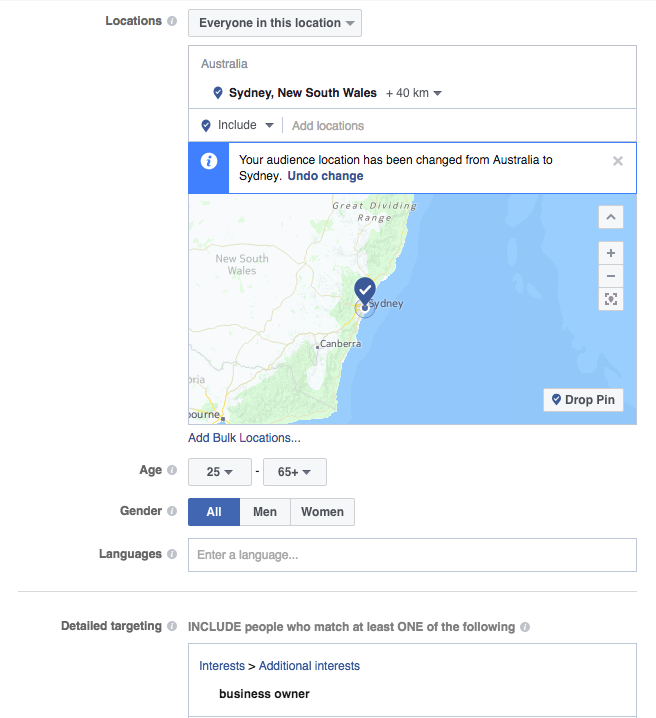 With 16 million active users in Australia*, Facebook is a data machine waiting to connect you with your ideal audience. If you’re wondering if Facebook advertising can work for your business, the following numbers may surprise you. Youfoodz, an Australian meal delivery service generated 15.6x return on ad spend and increased conversion rates by 16%. Australian fashion brand most known for its ‘The 5th’ watches saw 5x return on ad spend and launched a local brand to a global audience. With Facebook’s advertising platform you can set up Facebook ad campaigns, create multiple ads to test, target different audiences and measure ROI. Getting started with Facebook? 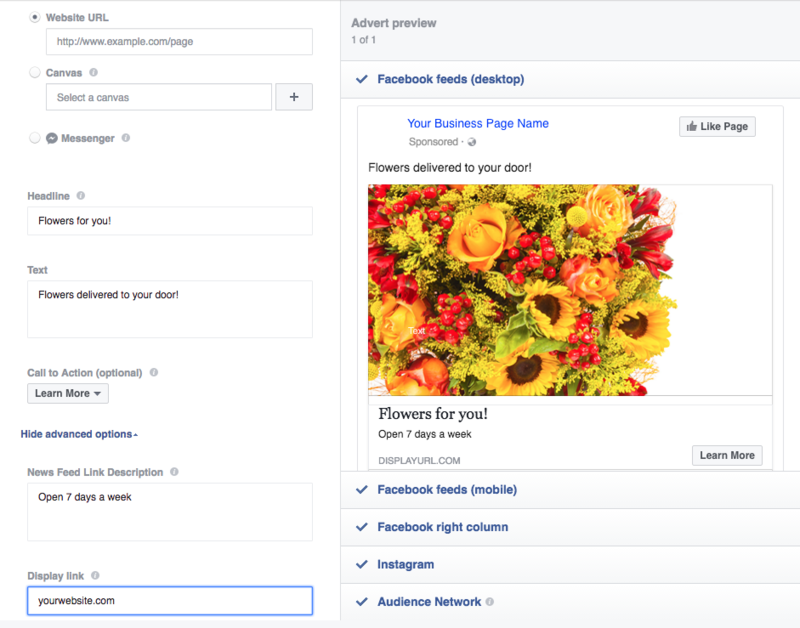 Use this guide to set up your Facebook advertising campaign so you can start attracting your ideal clients. If you’re planning for growth, you’ll need to create a business Facebook page and a business advertising account (known as Business Manager). With Business Manager, you can keep your business and personal pages separate and assign multiple account administrators to create campaigns and manage your Facebook account. Note: It is free to set up but if you want to start advertising right away, you’ll need to fill in your credit card details. The marketing objective you choose will depend on your social strategy. Doing so will help you get a better measure of success. For example, if you are looking to drive traffic to your website you will want to select ‘Send people to your website’. If you are selling products, you may want to consider choosing ‘Increase conversions on your website’. While this may seem self-explanatory, this is an important step to consider if you want to keep your campaigns organised. Be specific and consistent with your naming conventions. If your campaign is to generate leads for your legal services and you intend to target people in Surry Hills for example, you may want to label your campaign as Lead Gen – Surry Hills. In doing so you’ll be able to easily identify what campaigns work best. With the amount of data Facebook has on its users, you can identify audiences to target based on their demographic, interests, behaviours and other pages liked. In the example below, we've targeted all business owners in the Sydney area that are older than 25. 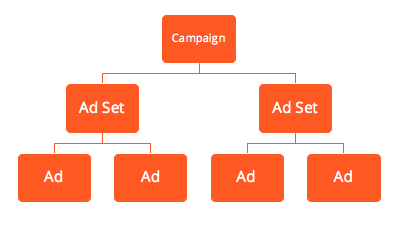 If you have other multiple customer segments, you may want to organise them in separate ad sets. When you are selecting your ad placements, you are choosing where you’d like your ads to be seen. Facebook automatically recommends placements for you but you can edit these. If you choose to advertise on Instagram, ensure you have well-presented imagery to support your ad as it’s a visual platform that favours professional and engaging images. When you’re starting out with Facebook advertising, you won’t know what will work until you try it. The key to success is through testing and learning and you can do that with just $5-$10 a day. 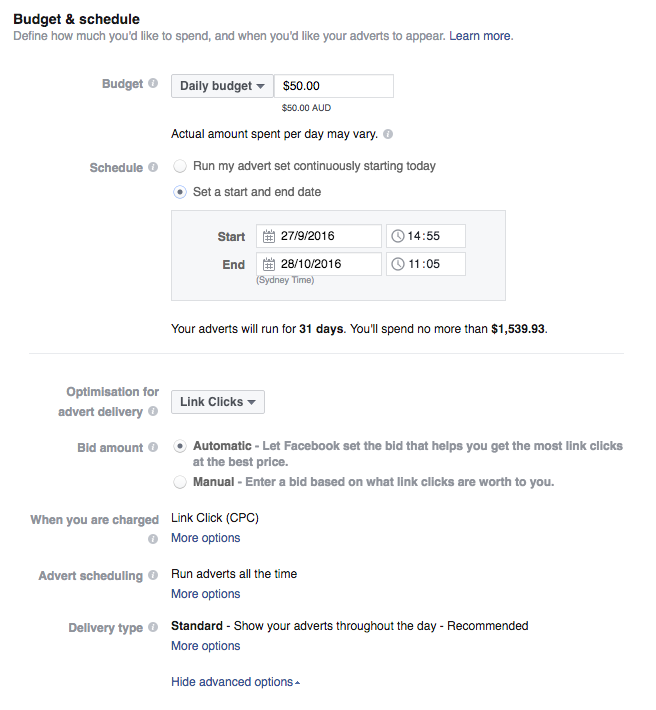 Daily budgets: Based on how much you’d like Facebook to spend on an ad set in a day. Lifetime budgets: Based on how much you’d like Facebook to spend on an ad set within a given time frame. Both options will try to spend your budget evenly per day. Choose your budget, campaign end date and bid amount. You can choose the “run my ad continuously” option but setting up an end date is recommended. When it comes to bidding, automatic is recommended option which means you will let Facebook set the bid amount that helps you get the most link clicks at the best price. Now hit the “continue” button to create your ad. Note about budgets: With the right strategy, you can generate leads with a little budget. When it comes to creating an ad, you’ll want your images to do the talking. You can use Canva on Facebook, an inbuilt function that allows you to create beautiful ads right from the Facebook platform. Tip: Keep text to a minimum when creating your ad. Facebook recommends having less than 20% text on an ad image. Select the business page you would like to link to your ad, add your ad link url, headline, text and select your call to action as per example below. All the specs you need to create your ad campaign. Hit the “place order” button and launch your ad. Once you get the hang of setting up your ad campaigns, you’ll want to implement some A/B testing. To identify top performing ads, create two ads to test per each ad set. When you are A/B testing, ensure you are testing one variable at a time i.e. if you want to test headline copy, the rest of your ad should be identical. If you are using Facebook advertising for the first time it may take time for you to identify what images and copy work. It typically takes 2-3 months to gather meaningful insights. From there you can refine and tweak the ads that provide you with the most ROI. When done right, Facebook advertising can be a game changer for your business but it takes the right strategy and investment in time. If you are considering Facebook advertising for your business but don’t have enough resources to plan and set it up, we’d love to help. Get in touch with our team of online solutions advisors to see how we can help you set up your first PPC campaign.